Whether you hate the '60s or love them, whether you're dyed-in-the-wool democrat or a committed GOP-er, "Magic Trip" is an essential piece of cinematic archeology that looks at understanding what the hippie/freak movement originally meant and how one of the founders felt about both its triumphs and failures. Alex Gibney and Allison Ellwood, who have made a number of documentaries together as director and editor, have collaborated as co-directors on a new documentary, "Magic Trip," made almost entirely of footage shot and recordings made by Ken Kesey and his band of Merry Pranksters as they set out from Kesey's home in Sonoma, Calif., for the 1964 World's Fair in Queens. 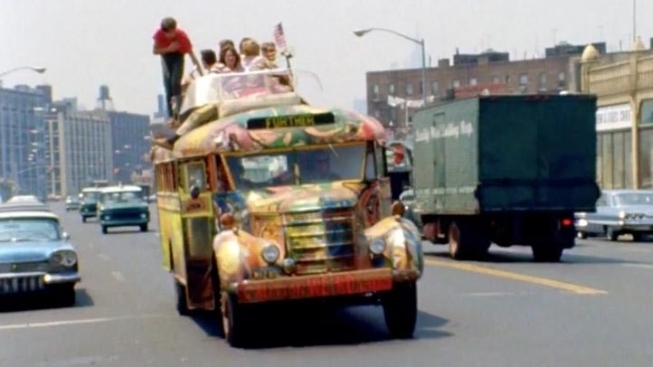 Armed with a quart jar of OJ (or maybe it was lemonade) mixed with LSD, a significant quantity of marijuana and a ton of film and audio equipment that they didn’t know how to use, Kesey and freinds headed east. Driving the bus was the pre-eminent wheelman of that era's counter-culture, Neal Cassady, the inspiration for Dean Moriarity in Jack Kerouac's "On the Road." The film follows them as they hit LA, Houston, New Orleans, Pensacola, and New York City and points in between, spreading their special brand of drug-fueled mayhem wherever they went. Along the way we watch as couples are formed and broken, two Pranksters beg off, one gets lost and Cassady time and again manages to convince the cops they're doing nothing wrong. All the action is narrated by the participants themselves, sort of like a DVD bonus feature with commentary. Gibney and Ellwood were lucky that rather than having to conduct interviews with their subjects, unreliable sources in even the best of circumstances, they had access to hours and hours of audio tapes of Kesey and the Pranksters that were made at the time of the trip and immediately after. Their recollections are raw and more honest than anything you could possibly get out of them today. Most all of them experienced highs and lows along the way, and Gibney and Ellwood do an incredible job of putting you on that bus to share the whole trip with them. In addition to chronicling this groundbreaking journey, "Magic Trip" also provides a fuller portrait of Kesey the man, tracing his transformation from all-American square to LSD fan (there are recordings of Kesey narrating one of his first acid trips, giving a remarkably coherent assessment of its effects) to author of "One Flew Over the Cuckoo's Nest," and leader of the Pranksters. And once Kesey got to the other side of the "Magic Trip" he changed his stripes yet again, remaining committed to Left-y politics while rejecting the counter-culture/hippie/freak movement he helped invent.